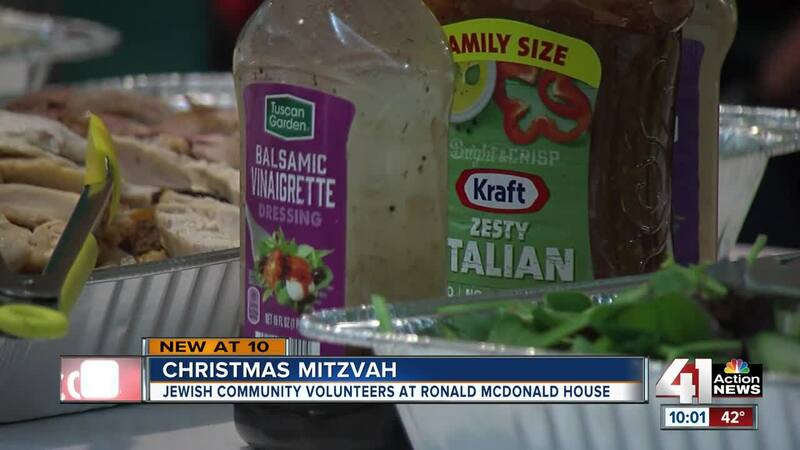 Dozens of volunteers spent their Christmas volunteering at the Ronald McDonald House, as part of Christmas Mitzvah Day. KANSAS CITY — Suzanne Gladney does not put up stockings or decorate a Christmas tree. In fact, she doesn't celebrate Christmas. But this Kansas City woman has a Christmas tradition she has been doing for decades. For 31 years, she and her husband have spent Christmas Eve and Christmas Day at the Ronald McDonald House answering the phones, cooking meals and driving families to and from the hospital. "One of the most important things we can do on Christmas is to give back to the community and to help other people, that's the real spirit of Christmas," said Gladney. And she's not alone. For dozens of families in the Jewish community, this has become their family tradition-- a mix of holiday cheer and giving. They call it Christmas Mitzvah Day. Jessica St. Hilaird and her husband Michael are among the families who were treated to a Christmas Day dinner. Their 3-month old son Dante is a patient a Children's Mercy. "It makes you feel blessed that people who don't even know you are volunteering their time, money and effort into making you feel better about what's going on in your life," said St. Hilaird. Christmas Mitzvah Day is open to all denominations. This years, Chiefs running back Chris Conley helped serve dinner on Christmas Day.